Nestlé, a leading food and beverage company, said that as a global company it is determined to help young people develop their skills so that they can find jobs or create their own businesses. Nestlé believes that communities cannot thrive if they fail to offer a future for younger generations. The International Labour Organisation (ILO) estimates that two out of every five young people are either unemployed or have a job that keeps them in poverty. In the Middle East, youth unemployment rates are estimated at nearly 27 per cent, higher than any other region in the world. The company aims to help equip the next generation for employment, to become inspiring leaders in its company – successful agripreneurs, entrepreneurs and game changers, regardless of their field or level of expertise, said a statement from Nestlé. This will help build thriving, resilient communities and support the United Nations Sustainable Development Goals (SDGs). Developing youth helps our business too, because young people are the employees who will keep Nestlé’s dynamic and competitive, the farmers who will grow the crops we need, and the entrepreneurs who will help us reach new markets. Hence in 2017, the company expanded its Nestlé needs YOUth initiative to encompass our entire value chain – from operations and supply, to agriculture and innovation. By doing so, it supported the company’s ambition to help 10 million young people worldwide access economic opportunities by 2030. -The Nestlé Center of Excellence, a Nestlé training academy founded in 2012 which trains university graduates in Saudi Arabia and Oman. It has so far trained 170 people, hired 42, and, since 2014, offered 200 internships and traineeships. -The Graduate Development Program, a three-year rotational development programme that aims to recruit distinguished graduates from leading universities in the region in the fields of marketing, sales, human resources, finance and control, supply chain, and technical. 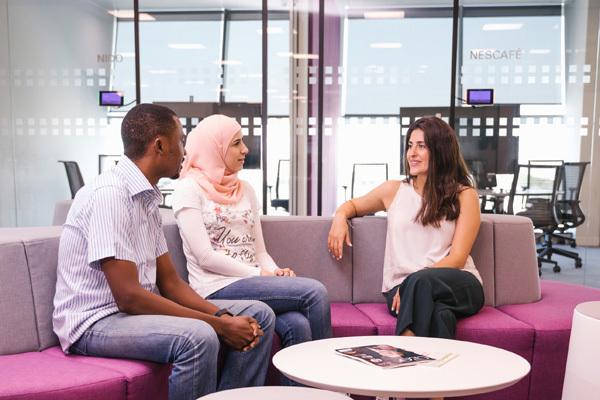 54 of Nestlé Middle East’s 2,300 youth hired since 2010 have so far joined the programme. -Career advising, implemented by working with universities across the region to offer expert advice to students in the areas of readiness for work, employability, business and corporate environment, and leadership. These impacted 4,700 people in 2017 through 50 events held in 10 countries across the region. Over the last decade Nestlé has helped prepare hundreds of thousands of young people for work, trained and supported 4 million farmers and helped 2 million women develop business skills, but we’re determined to do more. By providing apprenticeships and training opportunities, and hiring young people – like Pieter-Jan in Belgium – Nestlé is helping to equip them with the skills they need to thrive in tomorrow’s workplace. •Collaborating more closely with external partners, to motivate them to join us and increase the impact of our initiative. With less than 5 per cent of farmers worldwide under 35, jobs in agriculture are attracting fewer young people at a time when the world’s population is rapidly growing. We’re helping to inspire, train and enable the next generation of 'agripreneurs' – to give them the knowledge, skills and entrepreneurial spirit they need to manage farms in the 21st century. In 2012, the company started the Nestlé agripreneurship programme, to help young agripreneurs like Shaukat in Pakistan develop their skills through 'Farmer Connect'. Through this programme Nestlé source agricultural materials directly from around 685,000 farmers.